The brand name lends itself to inferring a range of toys that takes kids imagination to the next level. Under the umbrella of Mattel, it was launched in 2002 and at that the time was based on figures and playsets with themes of medieval and city rescue themes, which perfectly captured action settings including popular fortresses, dungeons and police stations. Over the years more themes have been introduced including dragons and DC Super Friends alongside an injection of technology through button activated functions within the toys to increase play value. 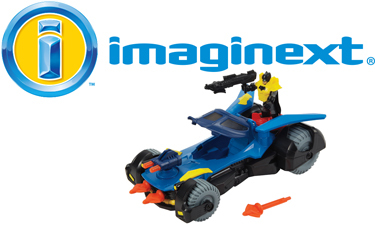 Within the Baby Brands Direct Imaginext wholesale range the toys include the DC Super Friends licence sets. The preschool toys cover a variety of price points catering for everyday toys to ones for special occasions with SRPs starting at just £12.99 and include both a vehicle and figure from the latest Gotham City instalment. Retailers can easily obtain at trade price the multi-functional Batmobile to hero characters including Batman, Robin, the Joker and Catwoman.